Husky A recipient Sally Grossman of Windsor and her two children. For Sally Grossman, success in business is likely to come at a cost – the loss of her health care coverage. Grossman and her two young children are now covered under HUSKY A, Connecticut’s Medicaid program. But to save money, the General Assembly voted last year to limit eligibility for the program, a move that will affect about 13,500 Connecticut residents. Grossman, 36, is a housepainter. A few years ago, she established a painting business which she runs out of her home in Windsor. Last year, the General Assembly voted for the second time to limit eligibility for HUSKY A for adults with dependent children or who care for an elderly or disabled family member. The first time the state cut the program, in 2015, the eligibility cap for it was lowered from 201 percent of the federal poverty level to 155 percent. That was a little less than $19,000 a year for an individual and $31,657 for a family of three, like Sally Grossman’s. Last year, the General Assembly voted to reduce the income limit again, to 138 percent of the federal poverty level, or $28,180 for a family of three. Supporters of tightening eligibility said it would put Connecticut in line with many other states and affect only a small number of the state’s 175,000 HUSKY A recipients. The cut is estimated to save the state $1 million this year, $22.6 million next year and $29.8 million in 2020. Supporters of the cut to the HUSKY A program, which is funded on a 50-50 basis by the federal government and the state, also said the low-income recipients that would lose coverage would be able to purchase a subsidized policy on the Affordable Care Act’s health insurance marketplace, called Access Health CT in Connecticut. But the Connecticut Department of Social Services determined that nearly 80 percent of those who lost HUSKY A coverage in that first group ended up with no health coverage at all. That’s because, even though those former Medicaid patients have low incomes and are eligible for federal subsidies to buy policies on Access Health CT, they still have to pay for part of their premiums, as well as other out-of-pocket costs like copayments and deductibles. Those premium and out-of-pocket cost are often unaffordable for people with low incomes, says Rose Ferraro, policy officer for the Universal Health Care Foundation for Connecticut. “It’s a huge effort for them,” she said. This second group of people who will lose HUSKY A coverage have even smaller incomes and will be less able to purchase private insurance, Ferraro said. Right now, HUSKY A recipients like Grossman pay no premiums or out-of-pocket costs. Before she was enrolled in HUSKY A, Grossman had a private health care policy. 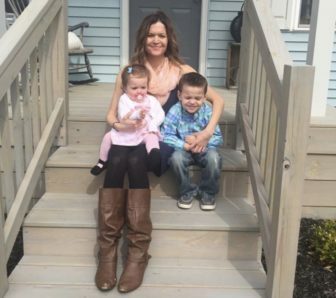 When she became pregnant and tried to add maternity care to her coverage – this happened in 2012, before the Affordable Care Act required all individual policies to have that coverage – her insurer denied her request. Because she had health problems during her pregnancy and delivery of her son Parker, she said she was fortunate she had been able to qualify for HUSKY A coverage. Health care advocates in the state are upset a “blue” state like Connecticut that has a Democratic administration is cutting Medicaid. They also say HUSKY has support among Republicans. They hope for a reversal of the new HUSKY A cut. “I think that both sides should be willing to step up to the plate,” said Sheldon Toubman of the New Haven Legal Assistance Association. After an outcry from those who depended on the program, proposed cuts to a Medicaid program that helps the elderly and disabled are restored, in whole or in part, in budget proposals recently promoted by Democratic and Republican lawmakers. But there’s been no move to reverse the looming cuts to the HUSKY A program. Many of those who will lose coverage may not realize it. Because of a provision of federal law, those recipients who have jobs, and an overwhelming majority of them do, had a one-year reprieve from the loss of coverage. Toubman said that caused a lot of confusion, because many recipients did not understand that their coverage would end a year later. Ferraro and other advocates also are concerned that parents who lose their HUSKY A coverage will think their children also are no longer eligible for the program and stop enrolling them. “Sometimes when parents don’t have coverage, children don’t get care,” Ferraro said. Even with the change in HUSKY A, children will continue to be eligible for the program, as well pregnant women. The cap for coverage for children is $41,044 for a family of three and $53,705 for a pregnant woman in a family of three.